We like to think of ourselves as a pretty pragmatic lot here at Red Brick Research. Of course we’re interested in statistical error, methodological validity and good sample design but ultimately we keep our eyes firmly focused on the practicalities of our clients’ decision-making. One of the ways we help our clients evaluate and think about research design is by rehearsing scenarios and ‘testing’ a proposed research design to ensure it’s up to the job. These miniature thought-experiments can be extremely valuable, and one common example is what we like to call The Marmite Test. Love it or hate it, it’s certainly not ‘normal’. 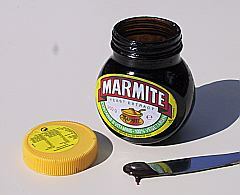 As we all know, Marmite is a delicious/disgusting yeast extract spread produced by Unilever in the UK and marketed under the slogan “Love it or hate it”. The Marmite Test applies this love/hate sentiment to research design at every level to make sure the research will adequately capture and represent the views of those at the extremes. Researchers are used to seeing bell curves and sometimes assumptions can creep into questionnaires, discussion guides, methodologies or even client briefs. Applying The Marmite Test along with other hypothetical response scenarios helps to ensure that the research is well designed. It exposes false or dangerous assumptions and ensures that the outcomes, however unexpected, are robust enough to enable our clients to make decisions with confidence. Delicious.